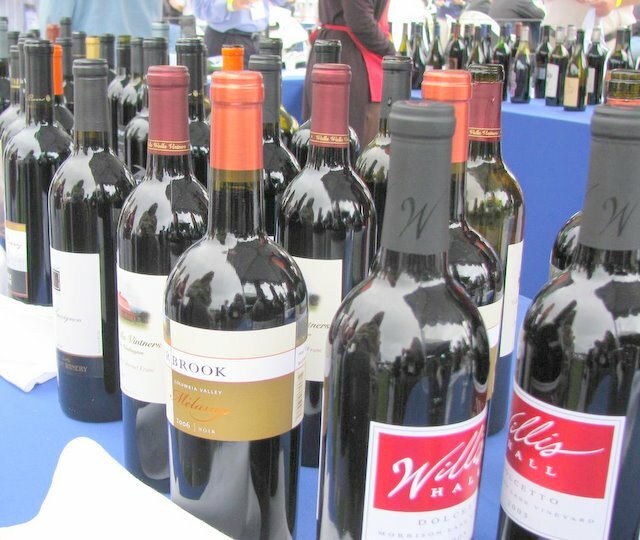 Since its inception in 1988, the Auction of Washington Wines has raised more than $23 million, with this year’s dinner-auction bringing in a perfectly respectable $1.5 million for both uncompensated care at Seattle Children’s Hospital and the Washington Wine Education Foundation. 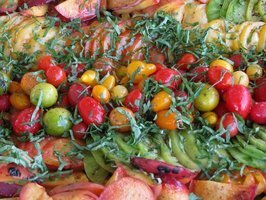 Cornichon's alter-blogger (and alter-eater/drinker) Jacqueline Pruner attended this year's opening picnic and barrel tasting. Here's her illustrated report. 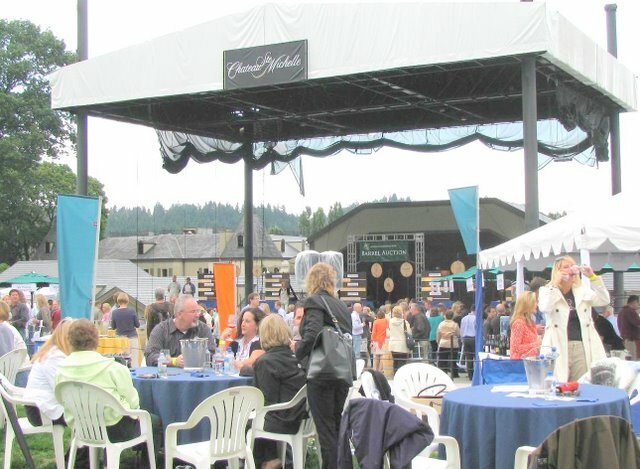 About 100 wines from across the state were poured at the kickoff on the grounds of Chateau Ste. Michelle. 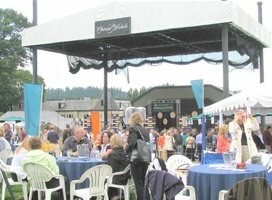 Impending rain didn’t keep moisture-loving Washingtonians from enjoying a tasty picnic presented by Andaluca and Tulalip Resort Casino. Chef Wayne Johnson--celebrating ten years at Andaluca--came up with a mojo grilled chicken with soft polenta (not much of a polenta fan, but I really enjoyed it); Tulalip chef David Buchanan served a sweet-meets-savory, blackberry-glazed Copper River salmon; and Chef Charles Ramseyer (back in Seattle after a figurative brush with death in New York) and with help from the students of the Seattle Culinary Academy--presented BBQ-perfect sides like mesquite-grilled asparagus & heirloom tomatoes and green pea and Tillamook cheddar salad – both worth going back for seconds. Or thirds. 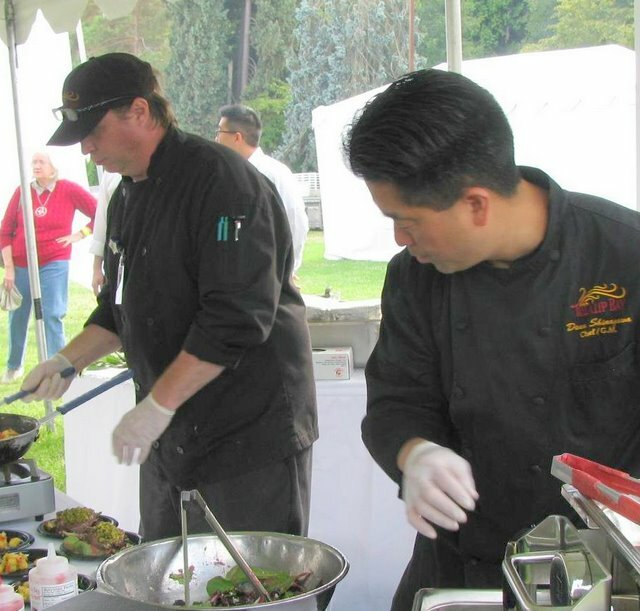 The highlight came from Dean Shinagawa – Chef and GM of Tulalip Bay Restaurant, on the right in the photo below -- who provided a Thai-style pesto-crusted filet mignon, served with Yukon gold potato hash, baby mixed greens, Oregon blue cheese, and raspberry mint dressing. 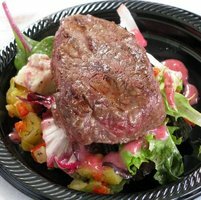 The filet literally melted in the mouth and had by far the most complex flavor mix of the evening. A treat with virtually any of the wines! Seven ice cream makers proudly displayed their latest creations. Home team Dahlia Bakery served up a delightful cherry ice cream within a profiterole. Triple coconut pie, yes, but who knew Dahlia made ice cream?! Now, I admit I’m a bit of an ice cream snob: I like ingenuity that mixes unique flavors with a stimulation of the palate, something that combines tradition with cutting edge. 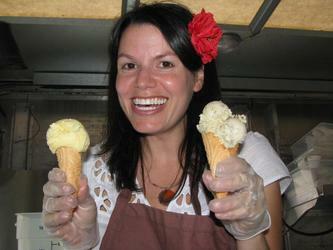 That said, sometimes an ice cream makes it (the “makers”), and sometimes, it doesn’t (the “breakers”). Makers: Full Tilt, a fab new ice cream parlor that can make chocolate-covered bacon, peanut butter and banana work like a charm in its Memphis King ice cream (the Ube – pronounced [ooh’ bay] – or purple yam is also worth a try); Molly Moon’s ice cream “boutique” with its sweet-creamy-floral honey lavender; Empire with its gorgeous and very corny – in a good way, that is – Sweet Corn Caramel ice cream; and Half Pint with its oldie-but-goodie chocolate mint and, last but not by any means least. Maker Masterpiece: But Parfait – with its organic, artisan ice cream creations – I confess was my absolute fav – owner Adria Shimada’s Fresh Mint Stracciatella is truly for adult tastes, complete with a lovely and natural fresh mint taste. Breakers: Molly Moon’s Thai Iced Tea ice cream (low on the tea flavor) and Poco Carretto’s overly-strong Salted Butter Caramel and Burnt Sugar gelato flavors--the only two left by the time I worked my way over to their booth, er cart. Ah, well. They call it the Alphabet District, although it's on the edge of Nob Hill, two vibrant streets (NW 21st NW 23rd) in a neighborhood of elegantly gentrified Victorian homes. It's lively and urban. Kids in strollers and dogs on leashes compete for territory on the shady sidewalks, and a steady parade of well-dressed tourists and flip-flop-shod locals make the rounds from shops to coffee houses, from theaters to bars and restaurants. 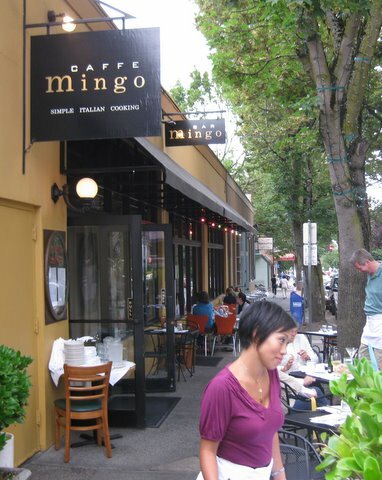 So many of them were queuing up at Caffe Mingo, a wildly popular Italian spot, that the owners took over the space next door, renaming it Bar Mingo, so their customers would have a place to wait. Instead, many of them are opting to spend the entire evening. And at the happy hour prices, at least, who can blame them? A martini made with Monopolowa, $5. Lamb meatballs in tomato sauce, $5. A generous salumi plate with onion relish, $5. House wines, $5 Two PBRs, $5. This page is an archive of entries from August 2009 listed from newest to oldest. July 2009 is the previous archive. 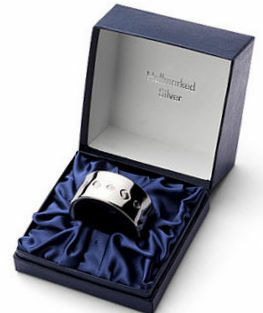 September 2009 is the next archive.